Oh my… you have never seen an airbag like this. 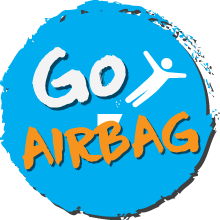 Super fun and a great safe way to practice new tricks our air bag is positioned in clear view of the cafe area so you can really show off! We have a single lane trampoline into the giant airbag, or why not take on the vertigo-enducing dive platform. A real test of nerves when you climb the steps and look out. Take flight, have fun, safe landing!